The staff really enjoyed working with Mary. Â Everything was very easy but also very productive. I’m proud of all my work, but I’m particularly proud of this two-day communications workshop I facilitated in Lithuania earlier this month. Â The workshop was for Eurasian Harm Reduction Network (EHRN), which advocates for the the human rights of drug users. Â They were a great group to work with and we accomplished a lot in two days identifying and evaluating their key goals, audiences, and communications products. 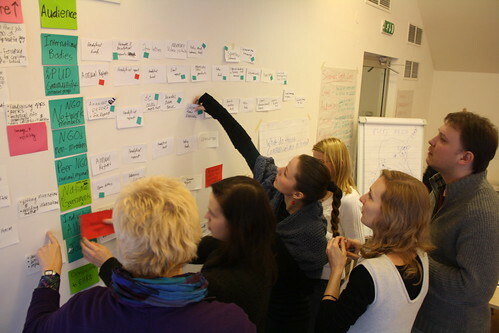 Staff evaluate the strategic value of their current communication products in an interactive exercise.